A’s artists-in-residence program in an elegant and striking way. The 16” x 14” black and white portraits are a part of Atlantic Center’s permanent collection. View an excerpt from Jack Mitchell’s documentary to learn more about his life chronicling the arts. 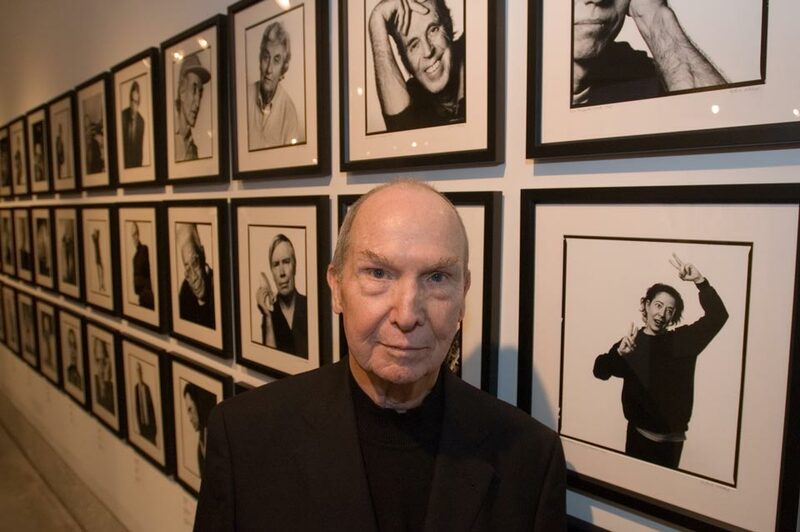 Jack Mitchell, American photographer and author, was best known for his photographs of American artists, dancers, film and theatre performers, musicians and writers. Through this film, Director Craig Highberger follows Mitchell’s acclaimed career as a pivotal photographer of the arts for more than five decades. With hundreds of beautiful images and interviews with luminaries including playwright Edward Albee, Broadway star Patti LuPone, critic Clive Barnes, dance greats Merce Cunningham, Judith Jamison, and Kevin McKenzie, and author/composer Ned Rorem, among others, Highberger reveals Mitchell’s fascinating life and the art world he documented for Dance Magazine, The New York Times, After Dark and countless other publications. An excerpt written by poet and art critic, John Yau included in the book ICONS & IDOLS: A PHOTOGRAPHER’S CHRONICLE OF THE ARTS (1960-1995) organized by Atlantic Center for the Arts best tells his story. “We have all heard of someone described as a born writer, ballplayer, or musician, but I would wager that few of us have heard of someone described as a born photographer. Perhaps, this is because one simply needs too many things to make a photograph. However, even though I know that no one is ever a born writer, much less a born photographer, I am tempted to make an exception in the case of Jack Mitchell. For if you know anything about his life, and I don’t really know that much, you realize that Mitchell, at a young age, began to make his circumstances into a perfect launching pad for becoming a fabulous photographer, which is to say he worked deliberately at learning how to see what could only be seen through a camera. Even when he was an adolescent, it was as if he knew that by seeing something about others that hadn’t been noticed before, and photographing it, he would be able to shape the trajectory of his own life. When Mitchell was five years old, his family lived in Key West, and Ernest Hemingway used to take him on his daily walk to the post office. In Icons & Idols (1998), Mitchell tells us that this was his “first actual contact with an identifiable idol,” and that this occurred “well before [he] knew the words ‘icon’ and ‘idol.’ By the time he was twelve, and his family had moved to New Smyrna Beach, Florida, Mitchell was avidly reading Walter Winchell’s syndicated gossip column, as well as learning how to develop film and make contact prints from his father. When he was fifteen, he received his first and only press card, and was being paid for his work. While in high school, he photographed babies, children, and yearbook portraits, as well as attended the last showing at the local movie theater four nights a week. Mitchell credits the “meticulous and dramatic lighting style of the black-and-white films of the 1940s” with being the major influence on the way he sees and uses light. He also possessed a certain fearlessness and managed to convince adults that he should photograph both Veronica Lake and Victor Mature. In getting Lake to pull her hair back and Mature to ham it up, Mitchell reveals his remarkable ability to get well-known figures to assume an uncharacteristic pose, reveal something about themselves. Although done while still a teenager, these early photographs possess a sophistication that belie Mitchell’s youth. In 1946, after he got out the army, Mitchell returned to New Smyrna Beach and set up a studio. Restless and possessing an ambition that was far larger than his situation would allow, he decided to “create photographic illustrations inspired by mythology.” Each photograph in this set is a dramatic portrait; a mythical character aims an arrow or runs down the beach, toward a gilded apple that has been carefully placed in the foreground. Published in Modern Photography in 1950, Mitchell’s staged photographs of costumed figures captured the attention of Ted Shawn, the “Father of American Dance” and the founder of Jacob’s Pillow Dance Festival in Massachusetts. Shawn invited Mitchell to shoot photographs at Jacob’s Pillow in the summer of 1950. The rest is history. Mitchell’s subjects included world renowned dancers such as José Limón, Maria Tallchief, Alvin Ailey, and Tanaquil LeClerq, and he went on to become one of the great photographers of dancers and dance. His photographs of Merce Cunningham, Louis Falco, and Wendy Whelan—all very different from each other—are inseparable from our image of them. His photograph of Valentina Kozlova, which appeared on the cover of Dance Magazine in 1986, conveys the beauty of ballet, and its incredibly graceful ephemerality, in ways that few photographers ever have. In retrospect, what is clear is that Mitchell’s photographs are always what caught other people’s attention, got them interested in his work and in what he could do. It was the opportunity that his photographs of mythic figures secured for him, however initially tenuous, that got him to move to New York City, where he had a studio for forty-five years. For by the time Jack got to Jacob’s Pillow, all the photographic particulars for which he would become known were firmly in place. Only in his mid-twenties, he had been seriously involved with photography for more than half his life. Given Mitchell’s youthful interest in dramatic lighting, make-up in films, costumes, and the staged and choreographed scene, one begins to think that he looked at everything as if through a lens, saw in his mind’s eye how a photograph could register someone’s presence. It is his preternatural ability to see the image before it exists that has led him to make some of his greatest photographs. At the same time, Mitchell has never limited himself to the staged moment; it is just one of many ways he has worked. In whatever approach Mitchell takes, and it always seems exactly right, we recognize that he possesses an immense empathy for his subjects. It is not simply that he knows what would work with a particular subject; it is that he knows how to get them to shed their public image, their defenses, relax. In his tender portraits of John Lennon and Yoko Ono, which Mitchell took just a few weeks before Lennon was murdered; he has elicited a side of them that was seldom seen, except perhaps by their closest friends. Attentive to their pose, their faces, and even to the texture of their skin and clothes, he infuses his photographs with a palpable tactility. Sensing that we could (and of course we cannot) reach out and touch the weave of Lennon’s sweater and Ono’s scarf is what makes his photographs of them all the more moving. Around Mitchell, both Lennon and Ono let down their guard. Full of charm we always knew was there, Lennon mugs for the camera, while Ono looks at him both protectively and lovingly. In all of Mitchell’s photographs from this session, something of Lennon’s touching shyness and Ono’s tough-minded sweetness comes through. Mitchell’s interest in high contrast, costumes, multiple exposures, and the choreographed moment immediately distinguishes his work from that of other well-known photographers. His blacks are dense and velvety, while his whites can be as sharp and exacting as a surgeon’s scalpel. His photographs are sculptural, as they make us aware of volume, as well as different textures. Mitchell works all the time, even when he isn’t working. This is true of his photograph of Andy Warhol with his dachshund, Archie. The photograph was taken while Andy, the collector and taxi mogul Robert Scull, George Segal and James Rosenquist were waiting in the Scull’s apartment for Ethel Scull to show up, as all of them were to be photographed by Mitchell for The New York Times. Instead of waiting, Mitchell began taking photographs of Andy. As someone who was supremely conscious of how he was seen, Warhol was notoriously difficult to photograph. A public figure, he felt more at ease being Andy Warhol, rather than being himself. In Mitchell’s photograph, he has dropped his public persona. Tightly cropped, the photograph shows Warhol holding his dachshund close to his face in a moment of tenderness and intimacy. Mitchell’s photograph is a completely uncharacteristic and arresting view of Warhol, who claimed that he wanted to be a machine. One of Mitchell’s enduring strengths is his undercutting of the qualities we think of as intrinsic to photographs. Rather than underscoring the bodilessness of the images, he registers textures and forms. It’s like we can reach out and touch or embrace them. By registering both the face and the texture of the skin, he endows his photographs with a rare intimacy and thought provoking sensuality. He transforms Alfred Hitchcock into a large, craggy, immobile rock overlooking an invisible landscape, which strikes this viewer, at least, as one way to think of this mischievous director of the macabre. With her back arched, so that her head and neck are perpendicular to legs, and with her arms and fingers extending gracefully into space, the ballerina Wendy Whelan becomes a living sculpture embodying both the strength and fragility of dance and dancers. Mitchell’s bodies of work include the photographs he has taken of Alvin Ailey and his company of dancers; ten years of photographs of Gloria Swanson; portraits of Beverly Sills, Luciano Pavarotti, Montserrat Caballé and other opera stars, both in and out of costume; all the photographs he did for Dance Magazine; his more than five thousand special assignments for newspapers and magazines; his photographs of Andy Warhol and others, such as Candy Darling, the transvestite superstar, who were in his circle; his photographs of artists such as Alex Katz, Jasper Johns, Ellsworth Kelly, Philip Pearlstein, Roy Lichtenstein, Louise Nevelson, Julian Schnabel, and Eric Fischl. His multiple exposures of the mime Marcel Marceau and the conductor James Levine ring absolutely true. This is just the tip of the iceberg. For Mitchell worked in New York for forty-five years, and I am sure he never went a day without taking more than one photograph.